A bead of sweat dripped from Kulzar’s forehead and down his nose, finally coming to rest on his upper lip. His tongue flicked out and picked up the drops of perspiration, rubbing them against the inside of his sore, parched mouth. The temperature was always just above freezing, but moments like these made him nervous. Not that he was involved in any way. He was merely Kaylin’s apprentice, a quill pusher at best. He had come to Systan in hopes of learning the secret art of necromancy from one as revered and respected as he, but had found that the elf wasn’t keen on divulging his secrets. He had treated Kulzar kindly since their introduction, but never assigned him tasks of any importance. When his apprenticeship was over and he returned home, Kulzar expected to take a job in the mill or brewery like every other boy in his village. But that was another month away. 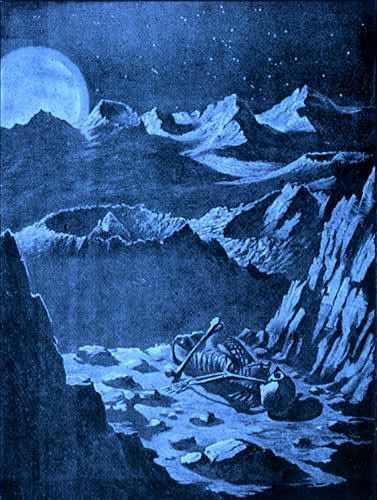 He still had four more weeks to spend on this freezing moon, jotting down notes on the spirits his master summoned from the rock, pouring over maps to scout out the next day’s terrain, explaining to the ignorant tourists why they were making this excavation and how an entire village would be set up in just ten years time. Sometimes he even looked forward to stirring a giant spoon in the mill. Kaylin’s hands were pressed onto the rocky ground, eyes closed in deep concentration. Kulzar stood several feet to his left, before a crowd of maybe thirty men and women who had recently been teleported and were staying the night. Kulzar hated these demonstrations; the people were always so abrasive, as if it wasn’t their decision to come and survey what could one day be their new settlement. Right now they were silent, however. Thirty pairs of eyes stared at Kaylin as the elf moved his hands in long, fluid circles upon the moon’s surface, whispering an incantation beneath his breath. He stayed in this stance for several moments before his hands began to raise upwards, a white misty fog trailing from his fingertips. This was Kulzar’s cue. He grabbed the bottle by his feet and uncorked it, placing it on the ground next to his elder. Kaylin moved his hands over the bottle and blew on his fingertips, causing the mist to float within it. Kulzar corked the bottle once again and slipped it inside his robe. Someone in the audience, a halfling, yawned. These people had paid thousands of gold each to witness an act of genuine necromancy; they expected it to have all the bells and whistles of other forms of sorcery, such as conjuration or even the controlling of the elements. But gathering the spirits from the ground was all they could do out in the open; the interesting part must be performed in private, when they were in a safe, controlled environment. A burly middle-aged man clad in billowing purple robes and several pieces of jewelry stepped forward. “What have you discovered thus far, my boy?” he asked. This is what everyone wanted to know. If there was an entire race of people who used to live here, where were they now? Wasn’t that proof enough that this moon was uninhabitable? Kulzar had pondered these questions himself every day since he had step foot on Systan, but was forced to keep his opinions silent. None of the elder mages in charge of this operation wanted to hear from a puny apprentice. The man scowled, clearly unsatisfied with this answer. They always were. Kulzar glanced over to his teacher and saw that he had risen from his crouch, now rested from the exercise. He had begun to walk down the platform – Kulzar’s cue to end the explanation and allow them to proceed with the rest of the tour. “If there are no other questions, you can—"
A wretched old lady had made her way to the front of the group and was pointing a long, wrinkled finger at Kulzar. A greenish yellow mucus sprayed from her lips when she spoke, some of it coming uncomfortably close to him. She began to walk towards the platform but was stopped by a guard, who grabbed her and picked her up in his arms. The old crone slashed at his face and tried to bite him, but he held her frail figure away from him where her arms or teeth could not reach. The lady continued to screech but her words could no longer be heard. The guard was taking her away to the teleportation chamber, where a mage would send her back home, without her belongings and without a refund. Kulzar sighed. This was not an uncommon occurrence. Necromancy, despite being older than most of the other magical arts, was still a very taboo subject. It had been practiced by the dark witches and sorcerers for as long as anyone could remember, and had only recently begun to be mastered by those of the light. Kulzar turned away before anyone else could interrupt him. It had been a long day, and he and Kaylin still had work to do tonight. He hoped he could at least fit a brief nap in before then. He walked down the steps of the platform. His boots crunched on the rocky surface of the moon every step he took. When he had first arrived, he had come to love that sound; it was so different than the fields and rivers he had trod in back home. Now he despised it. He despised everything about Systan: he hated the cold, the lack of sunlight, the desolate, hopeless emptiness of the place. One time he and Kaylin had journeyed for two full days collecting spirits. There were no vegetation or animals on Systan, and he thought he had grown use to this. But even knowing that, even having lived on this moon for over a month now, had not prepared him for those nights. At the commune there were some thirty mages who roamed about, not to mention the guards, workers, and the constant flock of tourists. And construction had been going on long enough for them to have the beginnings of their own small village. Kulzar had been homesick, but there were always people and reminders of home to keep him company. But that second night of their journey, everything had changed. There was nothing to be seen, just miles and miles of empty space. Even the stars hadn’t been present. Things finally caught up with Kulzar; he thought of his mother and father and friends back home, of grass and rivers and riding his horse out in the fields. He hadn’t seen any of those things in over a week. It seemed like years. He had become violently ill. Kaylin rose from his sleep and tried to help the young human, but Kulzar had tried to fight him off, screaming and throwing wild punches. He had connected more than a few; the elf’s smooth white skin was covered with bruises for several days afterwards. When Kulzar finally regained consciousness, he was in a bed, a cleric kneeling beside him whispering prayers of healing. It had been suggested that he return home and another apprentice take his place, but Kaylin, of all people, had been the one to refuse. The elf foresaw the difficulties of finding another apprentice and the time it would take to train him. So Kaylin had comforted Kulzar by telling him that he could see the inner spark inside him and that he could help kindle that spark into a fire until he blossomed into a powerful necromancer. Kaylin’s promise had yet to come into fruition, however. Things were just the same as they had been before, with Kulzar performing only the most menial and lowest forms of labor. He couldn’t help but feel played, but he was still glad he had chosen to stay. For one, he felt like the owed his teacher for his violent attack. He also didn’t want to return home a failure. Even if nothing came of his apprenticeship on Systan, he at least wanted people to envy him for doing something that was seemingly extraordinary. Kulzar walked up to the elf. He was always amazed – and also jealous – of how perfect Kaylin appeared to be. Tall and lithe, hair so light it was almost transparent, flawless skin without the slightest trace of facial hair. Kulzar, several inches shorter and his own hair black, greasy, and nearly covering his eyes, had become very self-conscious around him. He saw the way the women giggled whenever they passedd the elf, their eyes gleaming with lust. None of the girls had ever looked at him like that, even back home. “The bottle,” said Kaylin, reaching out his hand. Kulzar pulled it out from his robes and handed it to him. The misty white apparition still swirled around inside. “I hate the tourists,” Kulzar mumbled. He sighed. It was hard to argue with an elf. They always seemed to be right, no matter what the circumstances. They turned left onto the main road that led to the settlement. It had been in development for nearly three years, enough time for several houses and structures to be built. The mages each had their own home they could share with their families, if they had one; the apprentices and guards were forced to share enlarged tents. The embassy, where their laboratory was located on the far west side of the commune, was the first and also the largest building to be built upon Systan. The Systan flag – black and midnight blue with several tiny stars in between a sword and crystal staff – flew from atop the rotunda, though there was never any wind to blow it. But it could be seen from miles away, a reminder that here on this moon there was a chance to start a kingdom that would not be ravished by war or famine. A new beginning. Kaylin began to break away from him, lengthening his strides. “I hope you have been studying the new ritual I gave you?” he called back, his eyebrow raised. Kulzar sighed. He had forgotten all about the parchment he had put below his bed. There wasn’t going to be time for a nap after all. “Of course,” he called back, and began to walk toward his tent. Kulzar entered the laboratory. He had been within its walls many times now, but it still amazed him: the sparkling glass windows, the stone statues of mages and witches, the shelves as high as the twelve-foot ceiling, each one holding books, potions, and their ingredients. He had changed out of his robes and into a tunic and wool trousers. He and Kaylin worked alone and the need for such formalities had ended long ago. Kaylin may be very strict, but he only inflicted punishment when it came to the actual work. “I do,” Kulzar said. He had been studying it for the past several hours. It was very complicated, much more detailed than anything he had ever encountered before. Even after reading it again and again, he had yet to commit it to memory, and most of the required incantations were completely foreign to him. He didn’t see how Kaylin expected him to master it in such little time. Kaylin nodded and picked up a bottle from the shelf. He motioned for Kulzar to follow him and led him to the far side of the laboratory, where several cushions formed a circle around a large open space. The elf sat down on one; Kulzar did the same. Their exercises always began with several minutes of silent meditation. Kulzar had been able to put himself into a trance since he was five years old and had no trouble doing this. He visualized a sheet of parchment in his mind. He visualized every detail of the paper: the color, the creases, the tear it had in the left corner. He had been thinking of this same sheet of parchment for over fifteen years. When he had the parchment fully imprinted in his mind, he pictured words being written across it in a slow, plain script. YOU ARE IN A TRANCE, the words read. When he was finished with the first line, he started with the second, then the third, writing the same sentence over and over again until his subconscious was focused on nothing else. All outside noise became indistinct. Light no longer shone in his eyes. He was in an entirely different world now. A world of peace where nothing could harm him. “I’m afraid I do not," Kulzar said. He kept his eyes closed. He no longer had to concentrate; he had now transcended into another plane of existence. Kaylin’s words were a buzz in the background that his ears didn’t hear but his mind somehow rendered coherent. There was a loud pop! and Kulzar knew that his mentor had uncorked the bottle. The smell hit his nostrils at once: the smell of charcoal and brimstone and burning leaves. The smell of the dead. The elf began to hum, the sound growing louder every second. Then he began to chant. It was the most ancient chant known to anyone, the chant of necromancers thousands of years before them. The words could raise the spirits of those that had been deceased for millennia, could lift them from the afterlife and bring them three feet away, as if they had never left. It was a chant that made most of the living tremble with fear, but had come to be recognized as the most efficient way of discovering secrets that would otherwise remain lost. Why had the people of Systan disappeared without a trace? Were they in danger? Could the same thing happen to them? The spirits they had resurrected hadn’t been able to tell them much. It was also suspected that they were hiding something. Spirits did not like to be summoned from their resting place to be pestered with questions; they were often disagreeable and sometimes hostile. Kulzar began to feel the spirit taking form. He could sense its presence because the trance made him part of its plane of existence. He sent out soothing vibrations with his mind to calm the spirit, imagining a soft wave of water washing over the departed soul. Then he envisioned a bright light coming from his mind so the spirit could see what was before it. Kulzar heard the elf speak in the back of his mind. When he awoke, he knew he would have trouble remembering the conversation, so he didn’t linger on it for very long. All of his energy was focused on keeping the spirit docile. “My name is Zebris Zelluah," the spirit spoke. His voice was thick and husky and interlaced with heavy pants. “Is there anything you would like to tell us about yourself?” Kaylin asked. “Anything you think we would be interested in,” the elf said. Kulzar kept focusing on the brilliant spectrum of metaphysical light he was filling the room with. Make the spirit passive, he thought. Soothe it. Give it a chance to speak. “I was a warrior,” the spirit recalled. “Please explain yourself,” Kaylin said. The hair on the back of Kulzar’s neck stood on edge. Rarely were the spirits this straight forward and open. They usually spoke in riddles and kept the two necromancers going in circles until their heads ached. Kulzar had shattered more than one vial in frustration. But maybe this time was different. Maybe they could extract some actual information. Kaylin’s voice raised in pitch, and Kulzar knew that he was thinking the same. He was growing excited. Kulzar could feel the vibration in the room change. There were flashes of orange and red and the temperature began to rise. The spirit was growing angry. He wanted to wipe away the perspiration forming below his hairline, but he had to concentrate all his energy on keeping the spirit stable. The flashes in the room became so brilliant that Kulzar began to grow faint. His eyes began to flutter and he felt himself slipping from the trance. He could no longer focus on the waves of energy; all his might was put into staying conscious. “Lycanthropes,” he heard Zebris say, and his heart skipped a beat. Finally, this was it. This was the reason they had been waiting for. The young apprentice felt his eyes roll into the back of his head and he was consumed by darkness. Kulzar wasn’t brave enough to say the word aloud. But he had a feeling that he would be hearing it a lot in the days to come. Kaylin and the Systan council were meeting in the embassy at this precise moment, discussing the revelation that had been made just two short hours ago. It all made such perfect sense now. Werewolves shape shifting cycles were controlled by the lunar cycles. Yet here they were on a moon – a place where a pack could run rabid without ever having to revert to their human form. It was a lycanthrope’s paradise. After Kaylin had recounted the conversation to him, they concluded that at least one werewolf had found its way to Systan, whether through teleportation or some other form of magic. Thus that one werewolf – or possibly more – had begun to transform the other people of Systan’s population, one by one, like a devastating plague from the Gods. Until there were no more people left. Then the werewolves would have begun to starve and, unable to return to their human form, had been forced to feed upon one another until none were left. The question had arose as to why all the spirits they had resurrected these past two months hadn’t offered this information. Of course, most of them had probably not been alive when the first wave of werewolves overtook the moon. As for the ones that were – well, it wasn’t uncommon for spirits to not recall disturbing events that had taken place during their lifetime. It was something they could choose to block out after entering the afterlife, or whatever it was that came after death. That was the reason he and Kaylin had so much trouble gathering information to begin with. But this one did remember. And he didn’t mind sharing with them, didn’t mind at all. He seemed to look back upon those times with relish; even after Kulzar had passed out, the werewolf and Kaylin had resumed their conversation. Kaylin had not told him much, only that the spirit had most definitely been a lycanthrope and that he had not only a thirst but a passion for blood. Goosebumps creepy crawled over Kulzar’s skin. They had finally found out the reason why. So much work. So many headaches and sleepless nights. But was it really over, or was this just the beginning? There were still so many questions to be answered, the two most important of which were where the werewolves had come from and was it possible for them to return? Questions that would be answered without him. He might as well not even exist at this point. Whatever was going to be done, he was not going to be part of it. That much had been made clear to him. Cursing all the elves who had ever lived, Kulzar walked into The Yellow Pumpkin, the only tavern in Systan. No one was going to listen to his problems, he might as well drown them out with a few glasses of ale. Maybe even a shot or two if he could stomach it. There was a lot of work to be done tomorrow morning, and he was sure to wake up early, but he had to grin at the idea of showing up still drunk even after half a night’s sleep. Would they send him home? Why had he even cared so much before? There were usually only a few people in the tavern, but this evening it was nearly full. It appeared that the recent findings had quickly spread throughout the rest of Systan, and rumors were blossoming in all corners. Humans, halflings, and elves alike huddled close together and whispered in excited voices of what the future could hold. Everyone was so preoccupied that they didn’t notice him as he walked to the far end of the bar and sat down on a rickety stool shaped like a pumpkin. He waved at the bartender – a furrow browed dwarf whose beard could have swept the floor – and tilted an imaginary glass to his lips. The dwarf grunted and brought him a mug of ale, scurrying off as he was called by another customer. The ale was cold and strong enough to numb his throat after only a few swallows. He swept his tongue around the inside of his mouth, wanting to feel nothing anymore, to be completely absent from reality. And it worked. After one mug he was buzzing pleasantly and felt like he could float to his bed and sleep for years if he had too. “Another!” he called out, making eye contact with the dwarf. Kulzar blinked and turned his head. He hadn’t even noticed the girl who had sat down next to him. She was human and had long pink hair that fell down to the middle of her back. Her eyes were a pale green, her cheeks showered with tiny orange freckles. His hand immediately went up to stroke the greasy curls of his hair; even slightly intoxicated, the girl’s beauty made him nervous. Kulzar didn’t know if it was the ale or not, but the girl’s leg seemed very close to his. Almost rubbing against it. And her tunic was cut so short so that the lower part of her belly showed. His eyes focused on her pink supple skin and he felt his blood grow hotter and flow faster. His concentration broke when there was a loud thud on the bar. He flinched, only to turn and realized the bartender had slammed his next mug of ale in front of him. He tried to shrug it off with a smile, reaching into his robes and throwing a few golden coins across the bar. “My name is Alexina, by the way,” the girl said, tickling his hand with hers. His eyes lowered to her hand. Her fingertips were sweeping back and forth across his open calm, and it occurred to him that she could be a whore. But that was very unlikely, considering the expenses of the tour she was on. Could it be possible that she just found him attractive? Girls never seemed to, especially ones as gorgeous as she. “Necromancy isn’t something that is learned very simply,” he said and scolded himself. He wasn’t being very flattering. “But you seem to be very intelligent,” he added quickly. A famous necromancer. Did she mean him? He took another sip of his ale. All of the mages were at council in the embassy. Kaylin’s chambers were in another quarter of the building, and he knew the password to enter. He could take her there and show her a few street tricks. Impress her. And then they could find somewhere nice and cozy. The mages had bigger problems to worry about now than one little tourist gaining entrance to the private chambers. Problems they didn’t want to involve him in. So why should he even consider asking their permission? “Come with me,” he told her and took her hand. The ale gave him courage he wouldn’t normally have. He led her out of the tavern, mug still in hand. Alexina never stopped smiling as they walked and was eager to listen to his ramblings of all the adventures he had already faced during his short time on Systan. Her eyes grew wide when he told her about the shooting star that fell just three feet away from him and she buried her face in his breast in fear during the story’s climax. His ale was finished by the time they reached the embassy. There was no one outside its doors; even the dwarf guards were at council. Kulzar led Alexina through the entrance and walked her to the laboratory, whispering the password. “This is where we work,” he said, vaguely aware that he was slurring his words. He waved his arms in mock flourish. “Right over there,” he said, waving his hand towards the shelves that were lined with bottles. He closed his eyes and began to hum softly, thinking of something to show her. He could summon a ghoul, he supposed. Those were easy enough to banish and didn’t cause much trouble. Or he could chant an incantation; but she probably wouldn’t find that impressive at all. He opened his eyes and flinched. Alexina was going through the bottles, reading the labels. Kulzar closed the distance between them but couldn’t bring himself to take the bottle away from her. If she got mad, she would go away. She might even tell someone that he had let her in here; he hadn’t thought of that. She could get him expelled from Systan, sent back to spend time in the jails back home. He would forever be infamous as the first convicted criminal on the moon. “That’s not true,” she said, placing the bottle back on the shelf and picking up another one. It seemed as if she was looking for one in particular. “Oh yeah?” he answered back. Alexina opened her mouth to respond but closed it just as quickly, her eyes lighting up. Her face blushed red, the same color as the scattering of freckles on her cheeks, and she bit down on her lower lip. “Want to do something fun?” she asked. Kulzar thought of her fingers tickling his palm back at the tavern, and it was his turn to blush. But the alcohol took away most of the embarrassment and he reached underneath his robes before he could change his mind. He had to use all his might to turn away from her and start walking away, practically racing towards the far side of the room where he could stand behind a few bookcases. He had never been with a woman and wasn’t sure if this was how things usually went, but he was in a hurry to find out. He pulled his robe over his head. Did she want him completely naked? He wasn’t sure. He was wearing an undershirt and tights underneath his robe. He should leave those on, he decided. He didn’t want to give too much away too soon. What was that sound? Was she chanting? He tried to listen but it was hard to make out the words. It did sound like an incantation, that was for certain. Yet only a highly experienced necromancer could know such a thing, and she was only a girl from Cloverton. The thought made his blood run cold, and he ran from behind the bookcase and gasped at what he saw: Alexina, sitting cross-legged on the floor, chanting over an open spirit. The bottle lay forgotten on the floor, its cork tossed aside. “Stop!” Kulzar cried, but the spirit was already beginning to take shape. He had to stop this. He tried to run across the room but found his feet were stuck to the floor. He looked down; there was nothing binding them, only the flat wooden surface. He tried with all his might to lift them up but to no avail. He was paralyzed. Tears welled in his eyes. He had no clue what was happening. Alexina ceased her chanting. The spirit was no longer a vague mist but now a human figure. No, not a human. The shape of pointed ears atop its head became apparent, as well as paws instead of hands. And it was covered with hair – no, fur – all over its body. Zebris. She’s released the werewolf. “What are you talking about?” he cried out. A wet, salty tear seeped out of his eyelid and crawled down his face, moistening his mouth. Kulzar opened his mouth to speak, wanting to do anything to get her to change her mind. His lips were stuck together, however, and he could not pry them apart, no matter how hard he tried. Alexina spread her arms wide and finished her incantation. The spirit soared into the air, flew around several times, before flying into her mouth. The girl grimaced, her face contorted in pain, but it only lasted for a brief second before it was an expression of complete bliss. Her limbs grew longer. He eyes turned yellow. She was still human, but now there was a beast inside her, a beast waiting to unleash its power upon those around her. Waiting to unleash its power in the embassy, where the mages were meeting this very second. She gave Kulzar one last glance before running out of the laboratory on all fours. Crowerd Robinson sleeps just outside Atlanta, Georgia. His stories and poetry have appeared in Visionary Tongue, Sinister Tales, Worlds of Wonder, and the anthology Christmas Fears, edited by Chris Bartholomew. Other interests of his include film, occultism, the balance of nature, and general weirdness. What do you think is the attraction to the fantasy genre? When I was growing up, my family was forced to live a very reclusive lifestyle. Rarely did we leave the house and vacations were unheard of. Books and other forms of art were all we had to escape such a dreary form of existence. I remain clueless as to what the word 'entertainment' means - to me, stories are the very marrow of life, the promise of a better tomorrow and a chance to feel content with today. All fiction is fantasy in a sense. And the thing about books is that they never leave. They are more honest than real life is. They can also be more gratifying. They do not judge or condemn their reader. Fantasy offers another world to live in, a world where you can be the person you've always wished to be, where there are no obstacles that can't be overcome. What is more attractive than that?